The Sept. 11 attacks have shaped U.S. politics, sometimes over the objections of victims’ families. 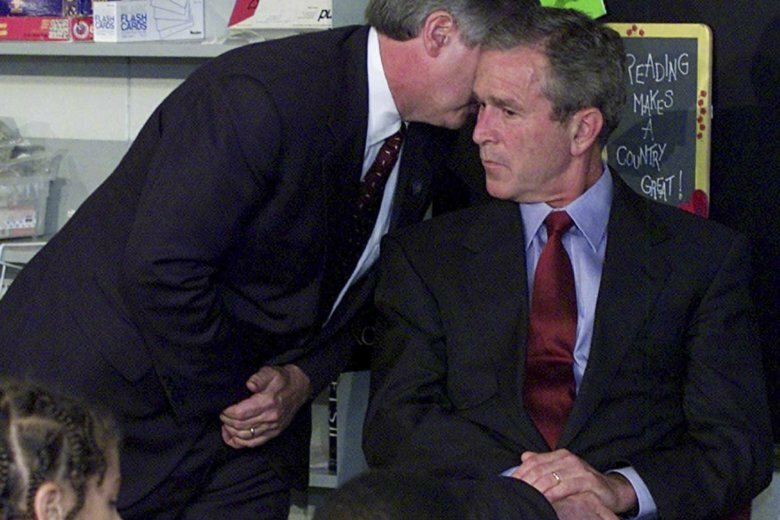 The attacks that crashed four airliners and killed nearly 3,000 also tested U.S. presidents, starting with that indelible image of still-new President George W. Bush hearing his chief of staff whisper news of the attacks that would define his presidency. Trump, talking about Muslims, said that “thousands of people were cheering” in Jersey City, New Jersey, as the towers collapsed. There is no evidence of mass celebrations there by Muslims. Trump has also said he lost “hundreds of friends” in the attack on New York City. He has not provided any names but has mentioned knowing a Roman Catholic priest who died. As president, Trump’s has proposed mass deportations and a ban on some Muslims traveling to the U.S. as part of his anti-terrorism policy. On May, 1, 2011, Obama ordered the strike that killed the attacks’ architect, Osama bin Laden, in Pakistan and put a trove of terrorist intelligence in U.S. hands. Obama wasn’t shy about that achievement. During his Jan. 10, 2017 farewell address in Chicago, he said he couldn’t have dreamed the U.S. would “take out the mastermind of 9/11” on his watch. And he noted the nation had come under no similar attack. “Because of the extraordinary courage of our men and women in uniform, and the intelligence officers, law enforcement, and diplomats who support them, no foreign terrorist organization has successfully planned and executed an attack on our homeland these past eight years,” he said. Bush standing before Congress, issuing a challenge to the rest of the world: “Either you are with us, or you are with the terrorists.” Bush, presiding over period of national unity to fight what he called the “axis of evil” and enact legislation to root out terror plots. The images of New York’s 107th mayor wading through the World Trade Center rubble with a bullhorn and face mask gave Giuliani a national profile as a key leader in the aftermath. However, he was later criticized for declaring the ground zero air quality safe. The U.S. Geological Survey determined it was toxic. He backed Trump in 2016 and is now the president’s lawyer as special counsel Robert Mueller investigates Russian meddling in the presidential election. But she is indelibly part of the response to the 9/11 attacks. Clinton, then a freshman senator from New York, stood on the stairs of the Capitol with other lawmakers that day sang, “God Bless America.” She was with Giuliani on the walk through the rubble of the World Trade Center. And as Obama’s secretary of state, she was there, hand over mouth, in the iconic Situation Room photo in which the president and his adviser watch the operation to take out bin Laden unfold. She said during a 2016 presidential debate that she had advised Obama to go through with the raid and she was “proud” to have done so. A generation of military personnel forged on the wars in Iraq and Afghanistan is retiring, and many veterans are running for seats in Congress on platforms of a can-do ethics that’s less partisan than it is pragmatic.